As of November 1, the federal government’s Supplemental Nutrition Assistance Program (commonly known as food stamps) was reduced for over 47 million people in America. This was the expiration date on the extra $5 billion provided to SNAP by the 2009 stimulus act. Meanwhile, since 2008, over 21 million people were added to food stamp rolls. Today, 1 in 4 American children live in a home that receives food stamps. Veterans and the elderly are also feeling the sharp pang of food stamp cuts, as reported last week. Monthly assistance to the needy is now reduced by $11 per person or $36 for a family of four. 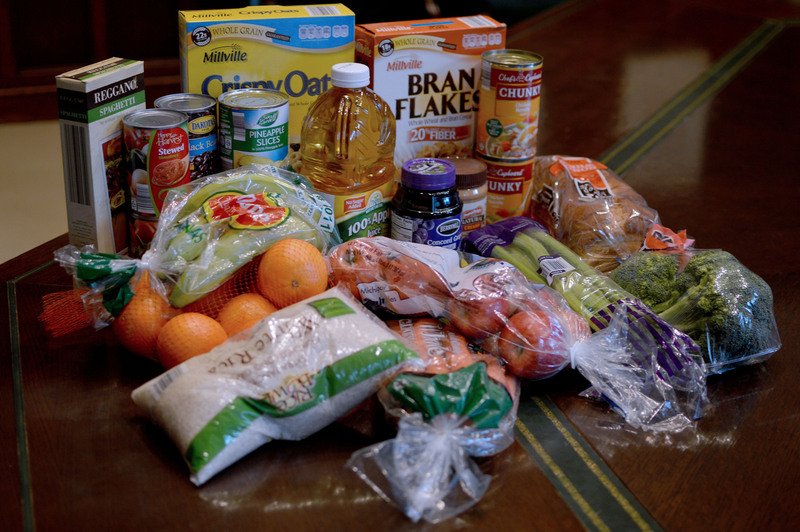 Until this month, the monthly maximum food stamp allowance for a family of four was $668. The new cut-off is $632. Food banks across the country are anticipating a dramatic rise in demand as a result, and are struggling to find the means to cope with the influx of need. Last week, Kate Maehr, executive director of the Greater Chicago Food Depository made the local media rounds, demonstrating what a $36 cut to families actually meant. Pictured here is all the food that $36 can buy at a discount grocery story. SNAP could face an additional $40 billion cut if House Republicans push through their new farm bill.